The Weekly Bible Lessons are a fundamental part of Christian Scientists’ study to gain a deeper, clearer understanding of God’s love and care for us. 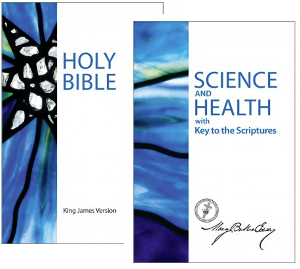 Each lesson consists of Bible verses and passages from the Christian Science textbook, Science and Health with Key to the Scriptures, and contain inspiration and insight on topics pertinent to daily living. At the end of the week in which a Lesson is studied, it’s read as a part of the Sunday sermon in Christian Science churches worldwide. Listening to the Lesson with the understanding and inspiration gained from the week’s study is the “icing on the cake” that can bless and benefit everyone. The Lesson is also an important part of the Sunday School class discussions, as young people learn how to apply these ideas in their own lives. These Bible Lessons are available in a variety of formats — print, audio, and eReader versions — so you can take inspiration from these Lessons at home or on the go.